Appeared at Alterniverse 5th Annual Toys For Tots Toy Drive, Salt Point, NY. Thanks to Alterniverse's Anthony Just, Jim Dunaway, Cliff Parmeter, and Crystal Hausler; the Toys For Tots team and the Marines; and fellow guests. Special thanks to the customers and attendees for supporting Alterniverse and Toys For Tots. Alterniverse will continue to collect toys through mid-December. If you couldn't make it on Saturday drop by soon to donate. Completed a Toys For Tots with Green Lantern pencil drawing for the Alterniverse 5th Annual Toys For Tots Toy Drive to be held on Saturday, December 6th at Alterniverse, 2510 Route 44, Unit 7, Salt Point, NY. The pencil drawing will be part of a silent auction with proceeds to benefit Toys For Tots. Doors open at noon. Come and spend the day with us! Completed a cover illustration for Atlas Games' Through the Aegis: Developed Covenants. This Ars Magica supplement "provides five fully detailed covenants... Whether you use the covenants as a base for your characters, as rivals, or just plunder the library to stock your own, this book is full of material ready for use in your saga." This volume has been slated for a March 2015 release. Until then, you can learn more about this book, see a preview of the full cover, and leave your comments on this Atlas Games Forum thread. Here is a preview of the Through the Aegis cover illustration. I have been signed on to complete the remaining three covers in the Ars Magica 5th Edition line. Thanks to the Atlas Games team for their trust and confidence. Looking forward to a strong finish and what lies beyond. Appeared at Albany Comic Con 14, Holiday Inn, Wolf Road, Albany, NY. Thanks to John and Matt Belskis, the Albany Comic Con crew, fellow artist alley guests, vendors, and the attendees that made this the best Albany Comic Con event yet. I contributed an ink drawing of DC Comics' Darkseid to the Ronald McDonald House Charities of the Capital Region, Inc. charity art auction. Thanks to all who participated in this show's auction by donating items or bidding. Appeared at Metatopia, Hyatt Morristown, Morristown, NJ. Thanks to Vinny Salzillo, Avonelle Wing, Darren Watts, and the Double Exposure team for another terrific show. Thanks to artist alley mate and fellow panelist Jack Parra not only for his hard work and companionship in artist alley, but also for arranging the How To Work With Artists panel. Thanks also to John Carimando for joining me and Jack on that panel and contributing his unique and invaluable perspective. Thanks to the convention attendees and especially those that took part in the art panel line for their thoughtful questions and hopeful outlook. Last, but not least, thanks to artist alley neighbor Leslie Casilli for her insight and important contribution to the "Art for Your Game, Without Breaking the Bank" panel discussion. November 5, 2014- Completed a set of 53 sketch cards for Topps' upcoming Star Wars Masterwork collectible card set. This card set is scheduled for a December 2014 release, so stay tuned for updates and sketch card previews. October 31, 2014- Prints of pencil drawings for The Hole-Male, The Hole-Female, Deep One Journal Entry, Vampirella, and Universal Monsters are on view at Argyle Studios Gallery for tonight's Halloween edition of Troy Night Out, Troy, NY. This exhibit focuses on fantasy and horror and showcases the work of many capital district artists. If you missed the show you can click here to see a sample of the art on this Argyle Studios Gallery Facebook post. Check out the Argyle Studios Gallery Facebook photos section for more art from the show. October 27, 2014- Completed 4 interior, pencil illustrations for Atlas Games' Between Sea & Sand: Mythic Africa. The Ars Magica supplement has been slated for a December 2014 release. Until then, you can learn more about this book, see a preview of the full cover, and leave your comments on this Atlas Games Forum thread. Here is a preview of the Between Sea & Sand: Mythic Africa cover illustration. October 10-12, 2014- Appeared at Council of Five Nations XXXVII, Proctor's Theatre, Schenectady, NY. Thanks to Council of Five Nations' David Cheng and Brett McLean; fellow vendors Quigley's Cakes, The Dice Witch, Cooper's Cave, Griggling Games, and Grimfoe Games; and the convention attendees for a wonderful weekend. October 8, 2014- Atlas Games' Mythic Locations is now available. I contributed 4 interior illustrations to this tome as well as the cover medallion illustration. You can see a preview of the full cover, and leave your comments on this Atlas Games Forum thread. September 27-28, 2014- Appeared at RoberCon, Roberson Museum and Science Center, Binghamton, NY. Thanks to Dan Westbrook, Jason Fiume, the RoberCon staff, the Roberson Museum, fellow vendors, and convention attendees for a terrific show. September 12-14, 2014- Appeared at Scare-A-Con, Turning Stone Resort Casino, Verona, NY. Thanks to the Scare-A-Con team for putting on a terrific event. Special thanks to Edward Yancey, Uptown Comics' Robert Upton and Mike Malott, Emmis Touron, Jeremy Harrison, Fenham Publishing's Jim Dyer, artist alley neighbors, and convention attendees for a great weekend. September 8, 2014- Completed a cover illustration for Atlas Games' Between Sea & Sand: Mythic Africa. This Ars Magica supplement provides cultural and magical details for the lands of Mythic Africa west of, but not including, Egypt. This volume has been slated for a December 2014 release. Until then, you can learn more about this book, see a preview of the full cover, and leave your comments on this Atlas Games Forum thread. Here is a preview of the Between Sea & Sand: Mythic Africa cover illustration. Appeared at Jack “King” Kirby's 97th Birthday Celebration with Hero Initiative at Excellent Adventures, Ballston Spa, NY. Thanks to Excellent Adventures' John Belskis, all of the Jack Kirby and comic book fans who dropped by the store, and Tom and Pat from the Geek Culture podcast team. A percentage of store sales went to benefit Hero Initiative and I began work on my part of a New Gods sketch collaboration which will be part of Hero Initiative's Jack Kirby Birthday auction. More news on the sketch collaboration and auction to follow. July 28, 2014- Completed 4 interior, pencil illustrations for Atlas Games' Mythic Locations. The Ars Magica supplement has been slated for a September 2014 release. Until then, you can learn more about this book, see a preview of the full cover, and leave your comments on this Atlas Games Forum thread. Here is a preview of the Mythic Locations cover illustration. July 26, 2014- Appeared at Highland Library Comic Con 2014, Highland Fire House, 25 Milton Avenue, Highland, NY. Thanks to convention organizer Jennifer Lombardo, convention staff, fellow guests and exhibitors, and, most of all, to the convention attendees for making this first Highland Library Comic Con outing a success. Looking forward to more great shows from Ms. Lombardo and the Highland Library team. July 23, 2014- Posted previews of the set of 57 sketch cards I contributed to Topps' newly-released Star Wars Return of the Jedi 3D collectible card series. Atlas Games' latest addition to the Ars Magica canon Faith & Flame: The Provençal Tribunal is now available. I contributed 6 interior illustrations to this tome as well as the cover medallion illustration. You can see the full cover and leave your comments on this Atlas Games Forum thread. Find out more about the Lou Carcolh, "The Dragon Snail of Bayonne." July 7, 2014- The Spanish-language edition of the Spirit of the Century RPG is now available for pre-order from the good folks at ConBarba. Our Spanish-speaking friends can click here to find out more about the Spanish-language edition of the Spirit of the Century RPG and click here to see other ConBarba offerings. Appeared at DexCon 17, Hyatt Morristown, Morristown, NJ. Thanks to Vinny Salzillo, Avonelle Wing, Anthony "Tiny" Acampora, Darren Watts, and the Double Exposure staff for another great show. Special thanks to fellow artist and Double Exposure artist alley organizer Jack Parra along with our artist alley neighbors and convention attendees. June 30, 2014- Completed a set of 57 sketch cards for Topps' upcoming Star Wars Return of the Jedi 3D collectible card series. No further news is available for this set yet, so stay tuned for updates and sketch card previews. June 20-22, 2014- Appeared at Heroes Convention, Charlotte Convention Center, Charlotte, NC. Thanks to the Heroes Con staff and attendees for a fun show. Special thanks to artist alley neighbor Mark Wright and his family for the good company. June 19, 2014- Completed a set of illustrations for an upcoming release from Fantasy Flight Games. More details and previews to come at a future date. June 15, 2014- Appeared at Albany Comic Con 13, Holiday Inn, Wolf Road, Albany, NY. Thanks to John and Matt Belskis, the Albany Comic Con staff, and the attendees for another terrific show. June 14, 2014- Appeared at Comic Con with the Cats, Joseph L. Bruno Stadium, 80 Vandenburg Ave, Troy, NY. On the night before Albany Comic Con 13, Albany Comic Con and the Tri-City ValleyCats joined forces for a night of comic books and baseball. Thanks to The Tri-City ValleyCats organization for hosting the Albany Comic Con staff and guesst and thanks to all of the baseball and comic book fans who came out to support the Tri-City ValleyCats and Albany Comic Con. June 12, 2014- Completed artwork for the DexCon 17 t-shirt and program cover. 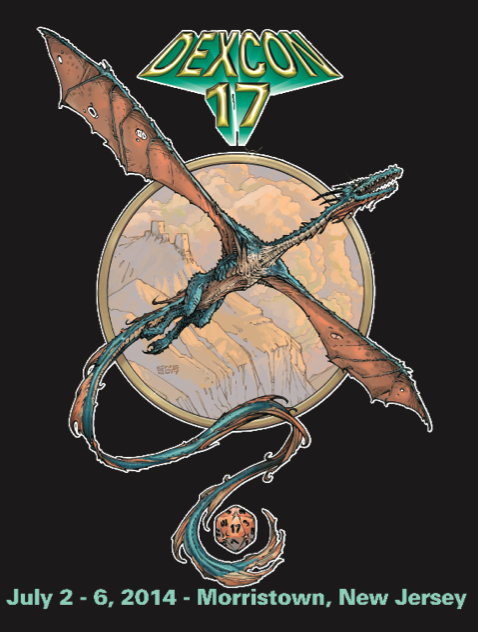 You can see a preview of the final DexCon 17 t-shirt design here. T-shirts will be available at DexCon 17 and can also be purchased when you pre-register for the show. June 7-8, 2014- Appeared at Terror Con, Rhode Island Convention Center, Providence, RI. Thanks to all of the attendees and guests for a wonderful show, especially Roger and Grace Kastel, Stacey and Danielle Frazetta, and Nate Osborne. Completed a pencil drawing of Storm from Marvel Comics' X-Men. The original drawing will be part of Albany Comic Con 13's Silent Art Auction. Albany Comic Con 13 is fast approaching and will take place on Sunday, June 15, 2014. Convention attendees will be able to bid on the original art for this drawing, artwork donated by other artists, as well as comics and memorabilia. Proceeds from the auction will benefit Ronald McDonald House Charities of the Capital Region, Inc.
May 28, 2014- Completed a cover for Atlas Games' Mythic Locations. The Ars Magica supplement has been slated for a September 2014 release. You can see a larger preview of the cover and leave your comments on this Atlas Games Forum thread. Here is a preview of the Mythic Locations cover artwork. A framed digital print of the Stone's Throe cover will be on view at the 49th Annual Fence Show at The Arts Center of the Capital Region, Main Gallery, Troy, NY. The Fence Show runs from May 22 to June 29, 2014. A sample of the 106 sketch cards that I contributed to Topps' newly-released Star Wars Chrome Perspectives collectible card series will be on view at the 4th Annual Cohoes Artist Showcase being held at The Venue at St. Joseph's Church, 65 Congress Street, Cohoes, NY. This short but wonderful show is organized by the Choose Cohoes Arts Committee and coincides with Cohoes, NY's Heritage Days Festival. A framed print of the Dinocalypse Now cover illustration will be part of the auction to benefit breast cancer research and the Choose Cohoes Arts Committee. Thanks to Fred Neudoerffer, Kathy Klompas, and the Choose Cohoes Arts Committee for putting together such a fine selection of artists and thanks to Dan and Jen O'Neill for offering The Venue at St. Joseph's Church as the venue for the exhibit. May 14, 2014- Topps' Star Wars Chrome Perspectives collectible card series goes on sale today. You can get a sneak peek at the 106 Star Wars Chrome Perspectives sketch cards that I contributed to this series on the black and white page. May 9-11, 2014- Appeared at Spectrum Fantastic Art Live 3, Kansas City Convention Center, Kansas City, MO. Thanks to John Fleskes and Flesk Publishing, Cathy and Arnie Fenner, Lazarus Potter, and especially Shena Wolf and the SFAL staff for putting together another great show. Thanks to fellow exhibitors D. Ryan Allen, Rob Schamberger, and Adam Schumpert and all the conventioneers that make Spectrum Fantastic Art Live such a special event. Took part in Free Comic Book Day from 10am-2pm at Dragon's Den, Poughkeepsie, NY and from 2:30pm on at Alterniverse, Salt Point, NY. Thanks to Zach, Dave, John, and the Dragon's Den team and Anthony, Cliff, and the Alterniverse team for the opportunity to share Free Comic Book Day with them and their customers. It was a terrific day. Looking forward to doing it again next year. Appeared at A-Lot-A-Con, The Hunt College Union, SUNY Oneonta, Oneonta, NY. Thanks to Jared Townsend, Annika Beard, and the A-Lot-A-Con staff for a terrific day. As always, thanks to the attendees for their generosity and support. Best of luck to all of you who are graduating and moving on in the next year. This was only the second year for A-Lot-A-Con. Hope to see this show growing and taking off in coming years. Completed a cover illustration for Turtel Onli's Nog: War For Planet Nuba. This graphic novel is part one of a two-part epic from the Father of the Black Age of Comics. The story follows the titular hero Nog and his fellow heroes of Team Blanga as they battle to protect their home planet from forces determined to tear it apart. Stay tuned to OnliStudios.com for news and release information. April 6, 2014- Appeared at the Annual Baby Boomer Collectibles and Toy Show, Holiday Inn, Wolf Road, Albany, NY. Thanks to John and Matt Belskis, the convention goers, collectors, vendors, and artist alley neighbors for another great show. Like its counterpart Albany Comic Con, this show is growing in leaps and bounds and it's a pleasure to be part of it. This year’s Annual Baby Boomer Collectibles and Toy Show at the Holiday Inn, Wolf Road, Albany, NY will take place on Sunday, April 6th. The convention will focus on the 50th anniversary of G.I. Joe, "America's Movable Fighting Man" and the world's first action figure. Those who buy tickets for the early preview also receive a limited-edition print with G.I Joe artwork by yours truly, John Hebert, and Paul Harding. Also, the Toy Show will have its own 50th Anniversary Limited Edition G.I. Joe doll. This 1960s era Joe doll kitted out for jungle warfare will be limited to only 25 in number. I was asked to contribute the box art for this Toy Show/Albany Comic Con Limited Edition action figure and you can see a preview of the box art on the digital art page. Visited the Van Corlaer Elementary School Autograph Club, Schenectady, NY. The Autograph Club at Van Corlaer Elementary School is a program designed to help the students study the importance of writing and reading by writing to celebrities, artists, authors, musicians, political figures, pop-culture personalities, and others and asking for an autographed photo along with a comment expressing the importance of reading. I was invited to spend this afternoon with the Autograph Club to discuss the fields of illustration and comic book art and, of course, to sign autographs for the students. Thanks to teacher and club organizer Jennifer Paley for extending the invitation and for a tour of the Autograph Club's extensive collection. Thanks also to Van Corlaer staff members Kristen Olochnowicz, Greg Rice, Katherine Kirkpatrick, and Leanne Vacca. Special thanks to fellow guest Darrell Pinckney for helping to facilitate the get-together. Thanks most of all to the students- Narayane, Chelsea, Angie, Bethany, Michael, Lorelai, Naved, Marvel, Selena, Jahnise, Jaden, Mackenzie, Giana Natalie, Lizette, Darryl, Jaeley, Mariah, Brady, Nahjiim, Kira, Bianca, Dylan, Alyssa, David, Liana, Kiara, Jennifer, Kalvyn, Kerianna, and Kalena- for their warm reception, thoughtful questions, and interest in the art of comic books and illustration. It was an honor to take part in this week's meeting and spend an afternoon with you all. March 15, 2014- Appeared at The "Memories, Moments and Mayhem" Convention and Wrestling Event, Ballston Area Community Center (BACC), Ballston Spa, NY. Thanks to Drake Evans and Scott Scarsdale from In Your Face Wrestling for having me on board for their second convention outing. Thanks to the convention-goers and show attendees for their continued support. Wrestling fans, check out In Your Face Wrestling. You won't be disappointed. March 8-9, 2014- Appeared at Albany Games Fest, Campus Center Ballroom, SUNY Albany, Washington Avenue, Albany, NY. Thanks to Jennifer Panetta, Marcus Cassin, and The Guild and all the convention-goers and fellow vendors for a fun and entertaining event. Atlas Games' latest Ars Magica supplement Hooks is now available. I contributed 5 interior illustrations to this tome as well as the cover medallion illustration. You can see the full cover and leave your comments on this Atlas Games Forum thread. February 28-March 2, 2014- Appeared at Genericon XXVII, Rensselaer Polytechnic Institute campus, Troy, NY. Thanks to Rachel King and the staff for putting together another terrific Genericon outing; thanks to Meagan Saareste, Zoe Williams, and the rest of our Room 239 neighbors for the good company; and thanks to the convention-goers for their creativity, conversation, and overwhelming generosity. See you next year! February 28, 2014- Completed a cover for Atlas Games' Faith & Flame: The Provençal Tribunal. The Ars Magica supplement has been slated for a June 2014 release. You can see a larger preview of the cover and leave your comments on this Atlas Games Forum thread. Here is a preview of the Faith & Flame: The Provençal Tribunal cover artwork. February 20, 2014- Evil Hat Productions' Zeppelin Attack! Kickstarter has reached it's goal of $21,700 and is now fully funded. If you haven't backed this deck builder card game set in the word of Evil Hat's Spirit of the Century roleplaying game it's not too late to show your support. The Evil Hat team have concocted a new stretch goal to boost the pledge amount and expand the scope of the game with the Doomsday Weapons Expansion. I've added more previews of the illustrations from Zeppelin Attack! on the Digital Art page. Take a look and stay tuned for more Zeppelin Attack! news and previews. February 12, 2014- Completed a set of 106 sketch cards for Topps' upcoming Star Wars Chrome Perspectives collectible card series. This series is scheduled for a May 2014 release. Stay tuned for news updates and sketch card previews. January 27, 2014- The Kickstarter campaign for Evil Hat Productions' Zeppelin Attack! is under way! Please head over and show your support. See some of the illustrations from Zeppelin Attack! on the Digital Art page and stay tuned for more ZA news and previews. January 22, 2014- Completed a cover for Evil Hat Productions' Stone's Throe, the latest in a series of novels set in the universe of the Spirit of the Century roleplaying game. This tale follows Amelia Stone as she encounters adventure, intrigue, and the Green-Eyed Monster on the streets, and rooftops, of 1930s Paris. No release date has been set, so stayed tuned to Evil Hat's website and social media for updates. See a preview of the cover illustration for Stone's Throe on the Digital Art page. January 2, 2014- Conquer the world with a flip of the cards! Look for the Kickstarter campaign for Evil Hat Productions' Zeppelin Attack! at the end of January 2014! See some of the illustrations from Zeppelin Attack! on the Digital Art page and stay tuned for more ZA news and previews.